Note: If you want to control the device by remote controller indoors, you need to buy an extra 315/433MHz RF remote controller. This RF Bridge can convert most of the 315MHz & 433MHz RF Remote Controllers into WiFi wireless. By adding the RF Bridge to App via WiFi, you can add up to four 1-4 buttons 315/433MHz Wireless RF Remotes to the RF Bridge device. After pairing the RF Remote buttons with RF controlled devices, you can directly control maximum 16PCS RF controlled devices on the App through network. It can be used for most of the 315/433MHz RF Remote controlled products, like RF controlled switch, RF controlled socket, RF controlled bulb, RF controlled (garage) door opener, etc. Even more exciting is that it can work with door magnetic sensor, human body IR sensor, and more other sensors to realize security alarm, and allowing you to DIY smart scenes. It can make your home smarter. *Convert 315MHz & 433MHz RF Remote controller to App via WiFi. *Make 315MHz & 433MHz RF devices App remote controllable. *Supports adding up to four 315MHz/433MHz RF Remote Controller/ RF Curtain Switch / RF Alarm. *Supports control up to sixteen 315/433MHz RF devices. 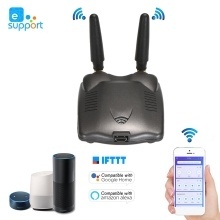 *Remote ON/OFF: Turn connected 315/433MHz RF devices on/off remotely from anywhere on the App. *Timing: Supports scheduled/countdown timing tasks to turn on/off at specified time. *The receiving supports fixed code 315/433 frequency, like PT2260, PT2262, PT2264, EV1527, etc. *Not support to copy rolling code and dynamic code. Ony 2.4G-WiFi is supported, Not support 5G-WiFi and Mesh WiFi network. *It can work with 315/433MHz RF door sensor/PIR sensor, etc. to push alarm message to your smart phone anywhere and anytime . Supports fixed code 315/433 frequency: PT2260, PT2262, PT2264, EV1527, etc.